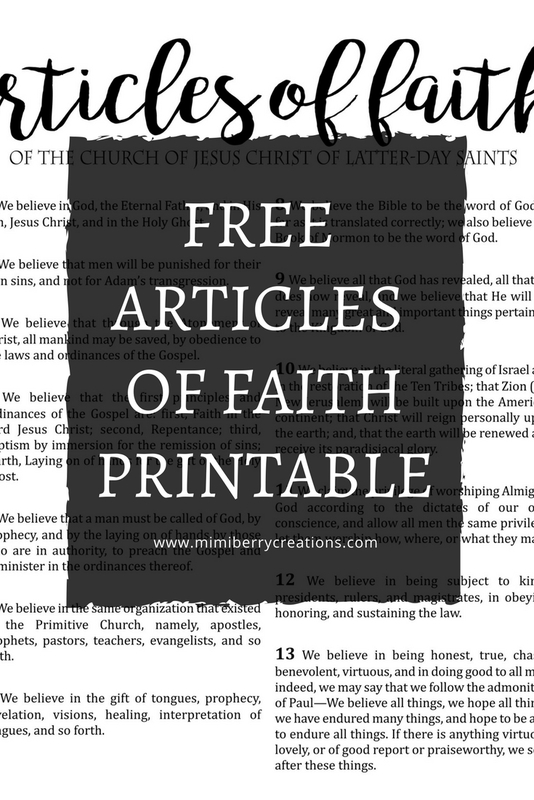 It's been almost a year since I posted this free printable of the Family Proclamation, and since then I have received so many requests for the Living Christ and the 13 Articles of Faith to go with it. 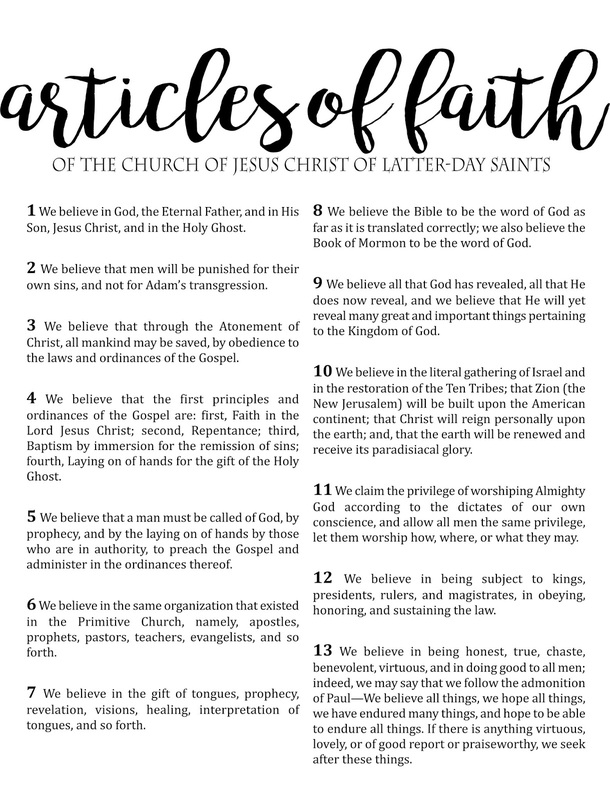 Today I am giving you the FREE printable of the 13 Articles of Faith, of the Church of Jesus Christ of Latter-day Saints. It can be printed as small as you like, but is prepared for a 24"x30" engineering print via OfficeMax or Staples, which are only a few bucks. 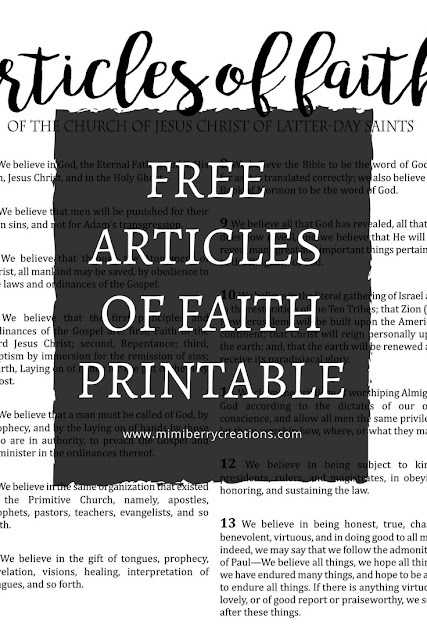 If "Family Proclamation" and "Articles of Faith" are things you've never heard of before, well then I encourage you to take a second and read them for the first time. I am assuming you've heard of "Mormons" before, and most likely have heard all kinds of things about who/what Mormons are, but equally likely they are untrue. Reading these documents will give you an idea of what Mormons truly are/what we believe, in a nutshell. And if you'd like to learn more, I encourage you to visit here. Because I made the Family Proclamation printable for a 24"x36" poster frame, I made this printable the same size. The fact that the file is a jpeg, you will be able to minimize it's size if you prefer printing it smaller. Staples and OfficeMax are the two places near me that offer affordable blueprints/engineering prints. Although they can print in color, these prints are often for large black and white prints. I have had them print a large photograph for my boys' room before, but large amounts of grayscale does not come out in the best quality. For prints that are all font, they work excellently. Click here to upload the file to OfficeDepot, who charges $3.36 for a 24"x36" print currently. If your computer is like mine, and blocks the ability to upload the file, call your nearest store and ask them for their print/copy email. You can then email the jpeg file directly to them with the size you would like them to print it. They will email you when it is ready for pickup. Once you order it, they will contact you to let you know when your print is ready. Click on the image below. Save the jpeg file to your computer. 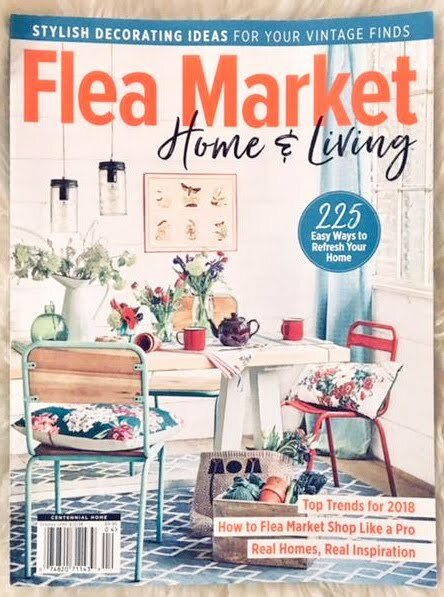 Or click here to download the PDF, or here for the jpeg if the file below doesn't work. And that is it! If you run into any issues downloading the above file to your computer, please comment below so that I can help you out. Thank you for adding these! I can't wait for the living Christ so I can finish the collection. If possible I would love to see it include the signatures at the bottom. I feel like it adds to their personal testimony! Thank you! Ill see if I can do that!